In addition to operating a successful retail gallery for nearly twenty-five years, RASgalleries and Ronda Schaer have earned their reputations and respect by presenting Single Artists Shows, which over the years, number over forty. Selected and curated by Ronda, a sampling of glass artists featured have been: Randy Strong, Jack Storms, Richaer Silver, Chris Belleau, William Zweifel. Ceramic artists, McGovney-Camerot, Barry Hage and Cynthia Hipkiss have also shown at Rasgalleries. 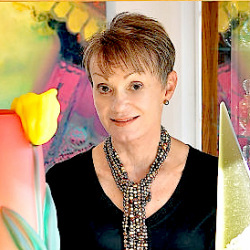 Additionally several off-site venue shows of art glass and/or ceramics and fine art have been organized and curated by Ronda at several locations such as wineries and public venues throughout the Napa Valley. In addition to RASgalleries own venue of shows, Ronda has juried and curated a wide spectrum of art shows for various groups, two local examples being the Napa Valley Open Studios and the Napa Valley Photographic Society. A most recent jury participation, "All Fired Up", a show for Gallery 66 in New York City, brought together an extensive body of work by fifty artists in the mediums of glass and ceramics, all works created with a liberal theme of "Fire". Entries were juried from a nation-wide call to artists. Founding Member of the Yountville Arts Commission... Developed the working guidelines and programs for the Gallery at Yountville Community Center and the Yountville Art Walk that are now a permanent part of Yountville's Town government. Proclamation from the Town of Yountville commending RASgalleries and Ronda Schaer for its many years of contribution to the arts and community service in Yountville.